Everyone is always asking for suggestions on what to do in New York. 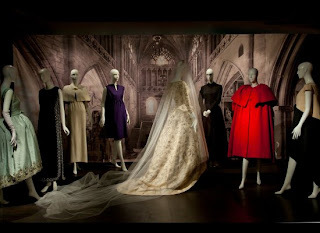 If you will be visiting over the holidays, I highly recommend making time for the Balenciaga: Spanish Master exhibition at the Queen Sofia Spanish Institute that runs through February 19, 2011. 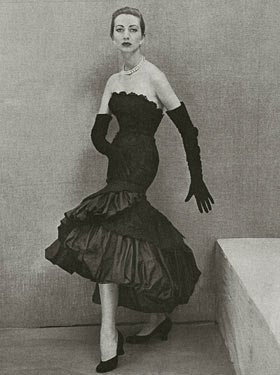 I didn't know much about Balenciaga before this show and it was an amazing introduction to this legendary designer. Vogue editor Hamish Bowles has curated the exhibition and many of the pieces on display come from his own archive. Cristóbal Balenciaga was born in Spain 1895 and learned to sew from his seamstress mother. 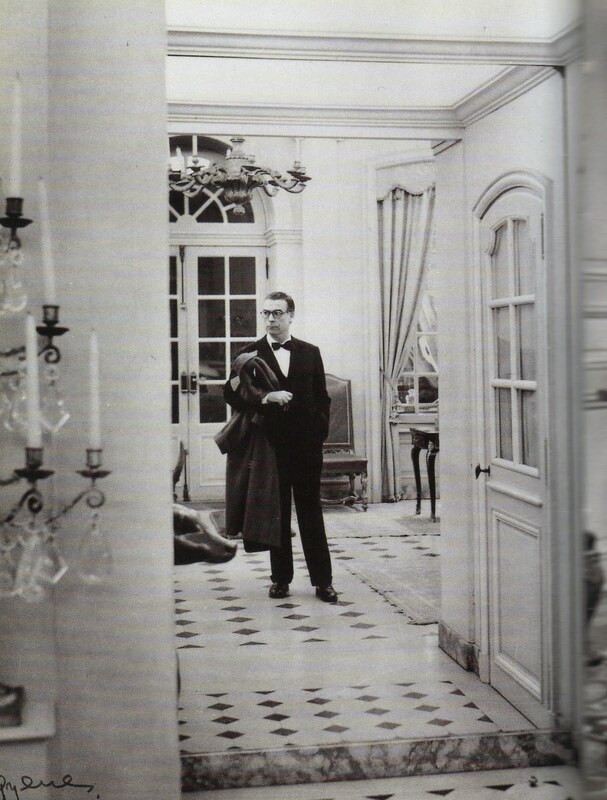 He apprenticed at a tailor at the age of 12 and was later sent to Madrid to continue his training. 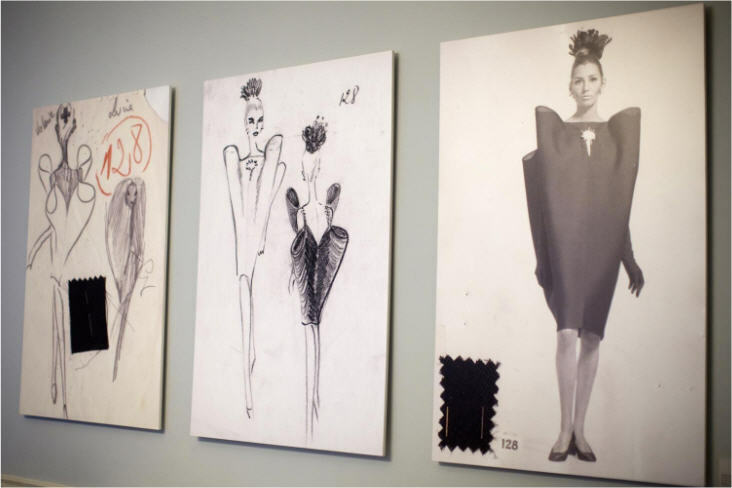 He opened his own boutiques in Spain but the Spanish Civil War forced him to flee to Paris. 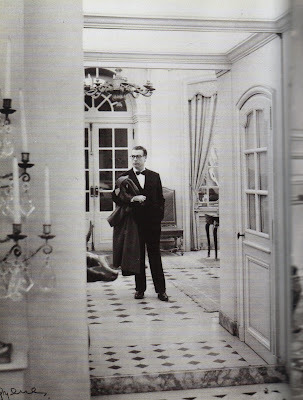 He opened his own couture house in 1937 but never lost sight of his Spanish influences. 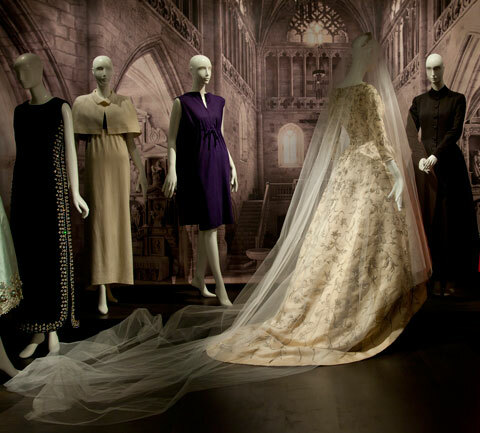 Diana Vreeland said, Balenciaga's "inspiration came from the bullrings, the flamenco dancers, the loose blouses the fishermen wear, the cool of the cloisters." 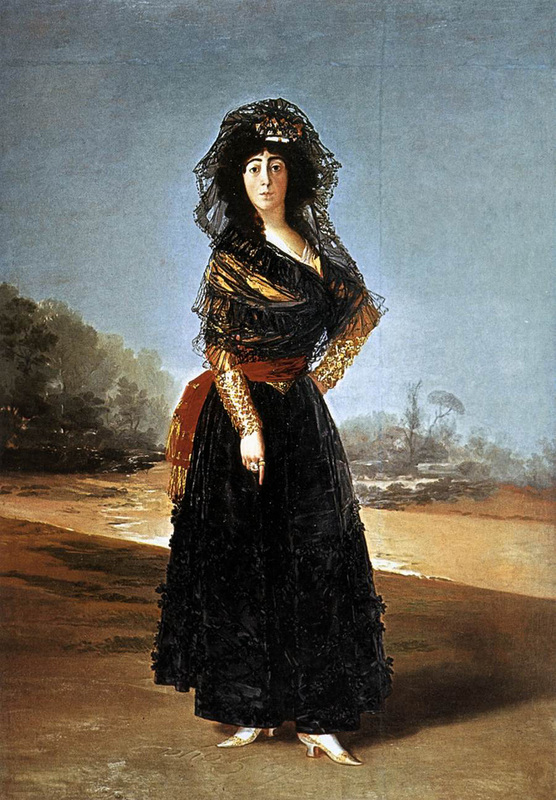 The exhibition is full of influences such as Spanish artists, Zurbarán, Goya, Picasso, Sorolla, and Miró; and of "Spain's religious dress and ceremony, its royal history, its rich regional costume, its dance traditions, and the power and splendor of the bullfight." 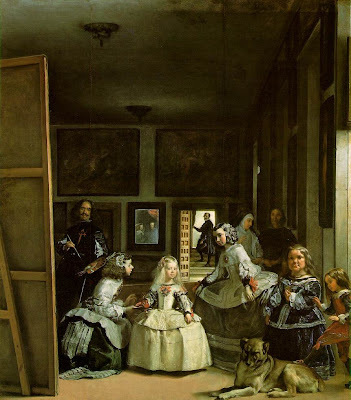 Balenciaga's "Infanta" dress from 1939 was inspired by the Diego Velázquez painting Las Meninas below. This black evening ensemble with "chou" wrap from 1967 was inspired by the Francisco de Goya painting La Duquesa de Alba below. 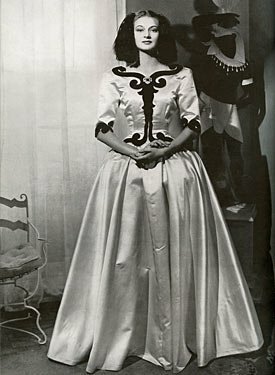 "Goya, whether Balenciaga is aware of it or not, is always looking over his shoulder," said Vogue editor Bettina Ballard. "He believes in lace and ribbon bows - never used in a fussy way but rather with true Spanish dignity." 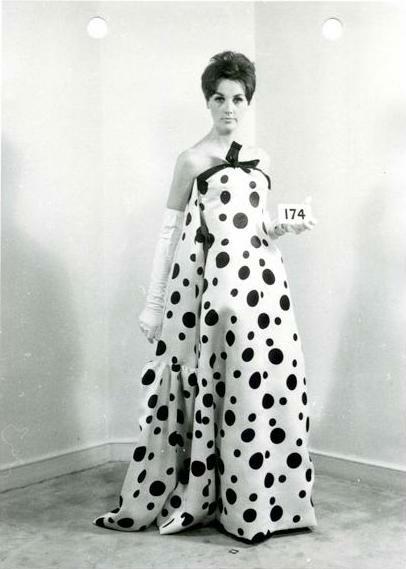 This black polka dot evening dress from 1964 was inspired by the costumes of Flamenco dancers. The same polka dot dress as seen in the exhibition. The carnation is the national flower of Spain and is also the flower thrown at the feet of the bull fighters. It is a recognizable symbol of the bull ring and is a reoccurring motif in the work of Balenciaga. The inspiration of carnations as well as Balenciaga continue in this dress from the spring collection of Oscar de la Renta. "The exhibition was conceived by Oscar de la Renta, Chairman of the Institute's Board of Directors, who has worked closely with the exhibition team to develop and realize the show. 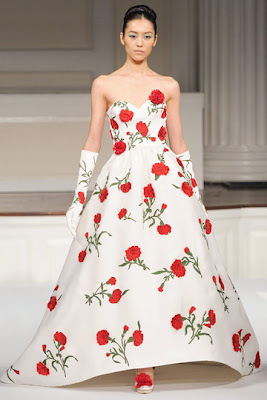 Mr. de la Renta himself began his career in fashion working in Madrid at Eisa, one of the Spanish branches of Balenciaga's fashion empire." 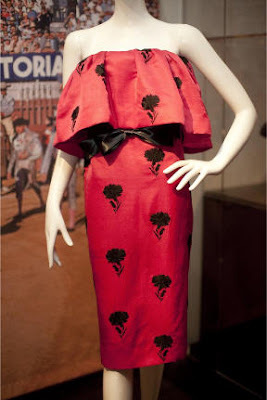 Another flamenco inspired Balenciaga dress from 1951. 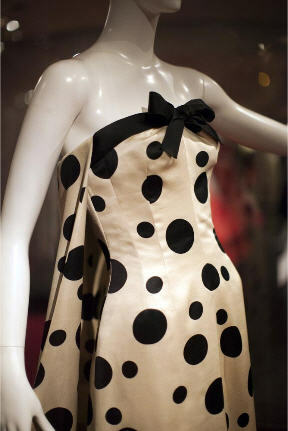 Some of Balenciaga's more abstract dresses were inspired by the work of Juon Miró. 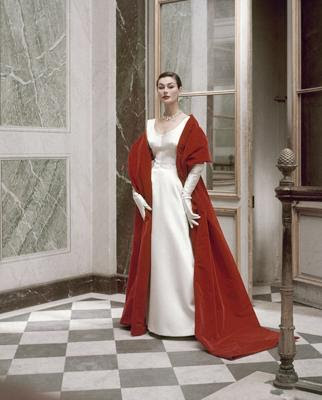 Balenciaga closed his fashion house in 1968 at the age of 74 to travel and explore Spain. He died in 1974. 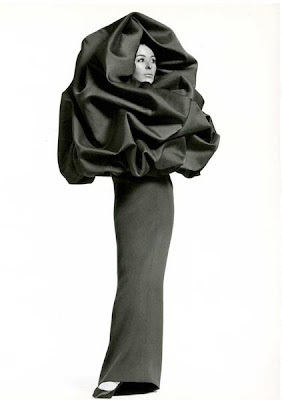 After his death, Diana Vreeland said, "Balenciaga did the most delicious evening clothes. Clothes aren't delicious any more."